Anyone who knows me knows would categorize me as a “crazy dog mom.” I openly admit that I am and wear my dog obsession with pride – he is my fur child. I walk him at lunch, explore puppy friendly vacations, ensure he is well taken care of when I travel, and prefer to engage in dog friendly activities after work. Pre-Wilson (my adorable 17 LB, 2-year-old cockapoo), I used to hit the gym after work, but since getting him I experience what I describe as “puppy mom guilt” – i.e., I don’t want to be working out while he is home, I’d prefer to work out with him! We go for runs (I have a dog running leash), go down to the creek to swim, head to the dog park, take hikes on the weekends, and recently we’ve started biking! How do you bike with your dog, you may ask? Simple, the K9 Sport Sack! I knew I needed this the first time I saw it. It took some convincing to getmy fiancé on board but I assured him I would only use it for biking and going on long hikes (if he gets tired). So what is a K9 Sport Sack? Simply put, it’s a dog backpack, but unlike other dog backpacks which have them confined or facing backwards, the sack allows your dog to perch on your back as if you were giving them a piggy back ride; they see what you see! On our first outing, Wilson was a little apprehensive – he wasn’t quite sure what was going on or why he was being stuffed and zipped into a backpack. After a couple minutes of being on the bike and having the wind blow through his little puppy ears, he was hooked! And so was I! Since then we’ve biked on a very regular basis. We have also used it when climbing a fire tower and I am considering using it the next time we fly with him. It has also been a great workout for me – biking with a 17 LB meatloaf on your back is challenging, especially when going uphill! 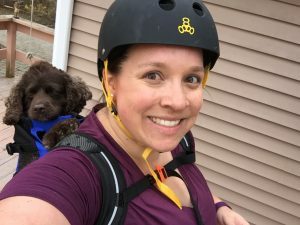 Fitness and wellness is important for both me and my dog, and while a little unconventional (I definitely get stares while biking around town), it works for us!